Toronto Commercial, Residential & Industrial Landscape Planning & Design Services | LandArtDesign - Landscape Architects Inc.
your project’s specific goals, while making the process as easy as possible for everyone involved from design to construction. A polished, highly-tailored rooftop terrace suited for the professional office with plenty of employee lounge space and entertainment options. A playful and colourful landscape winds its way through a large residential development in Mississauga’s City Centre. Lime-green logs act as sculptural features in the central courtyard, featuring spaces for play, rest and respite. 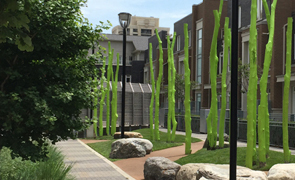 A creative landscape design provides condominium owners with an extension of one of the city’s largest parks, by injecting a large central courtyard flanked by high-rise condominiums on three sides. 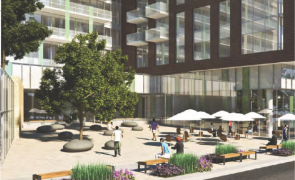 The result offers unparalleled views of the park, while retail space offers residents outdoor cafes, shopping and services right at their doorsteps.